1 can of beets(15 oz). 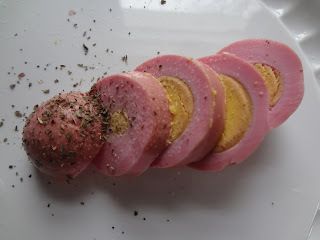 12 large, hard boiled eggs (shelled and whole). 1 tbs brown sugar (optional). You could also add a clove or two to each jar. #1: Drain Liquid from the beets into pot, and place beets, onions and eggs into jars. #2: Pour sugar, vinegar and beet juice into the pot and bring to a boil over medium-high heat. #3: Reduce heat to low and let simmer for 15 minutes. #4: Pour mixture over the beets, eggs & onions. #6: Allow jars to cool completely, and then refrigerate. Refrigerate for at least 3 - 5 days.